The Earl of Wessex undertook a two day visit to his old University town of Cambridge to mark the start of a yearlong programme of engagements, aimed at generating support for The Duke of Edinburgh's International Award. Through a combination of DofE events, Real Tennis tournaments and fundraising activity, His Royal Highness, Chairman of the Board of Trustees, will enable a new generation of young people to start their DofE journey in the UK and abroad. 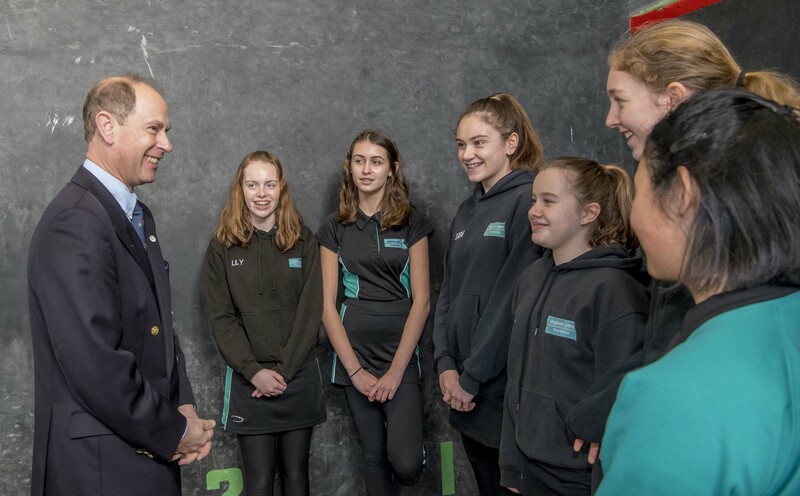 The Earl met young people from seven local schools who had been taking part in Real Tennis lessons from the professionals at Cambridge University Tennis Club. HRH learnt to play Real Tennis at the same club for his DofE Gold Award while at University and developed a passion for the sport, continuing to play for 30 years. The Earl took part in Tennis games against junior club members before attending a reception for volunteers and fund raising dinner. The vital support attracted by The Earl will help the DofE transform the lives of young people from all backgrounds and circumstances, across the globe. The Award currently operates in 141 countries and territories worldwide, equipping young people with the skills and attributes to reach their potential while building lifelong friendships.